Today was our middle day at the Mt. McKinley Princess Lodge. 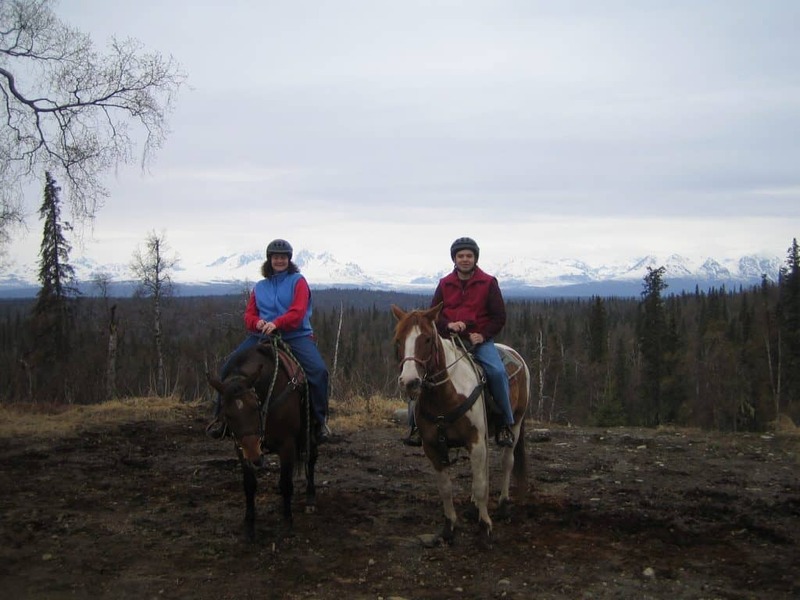 This morning, we headed off for a horseback ride on trails through the woods around the lodge. What a wonderful experience. The scenery is incredible and the ride itself was very enjoyable. A lot of up and down on the trails, making for an interesting ride, especially for those of us who have only been on a horse a few times. After having rode in Barbados, I can testify that a western saddle is infinitely more comfortable than an English saddle! Here’s a picture of us with a view of Mt. McKinley in the background (well, the mountain is there, but hidden from view due to the clouds). After the ride, we went for a nature walk on a trail in back of the main lodge with a park ranger. Everything is just starting to turn green here, with numerous berry bushes, ferns, and other plants peeking through the brush. Then we off to lunch and then another walk, this time on a trail above the lodge. More beautiful views of the lodge, the river, and the mountains. Now we’re hanging out at the lodge, doing some reading before dinner.